Grandview is a city in Jackson County, Missouri. According to the 2010 census, the population was about 25,000 residents in the city. Grandview borders Kansas City, Missouri to the south along US Route 71. For anyone in need of foundation repair, KC Pro is the professional company you need to be your solution. In 1912, Grandview became a railroad division point and terminal for Kansas City Southern. This new transportation brought a rise in the town’s residents into a city with 700. After that first influx of residents, the city continued to grow. 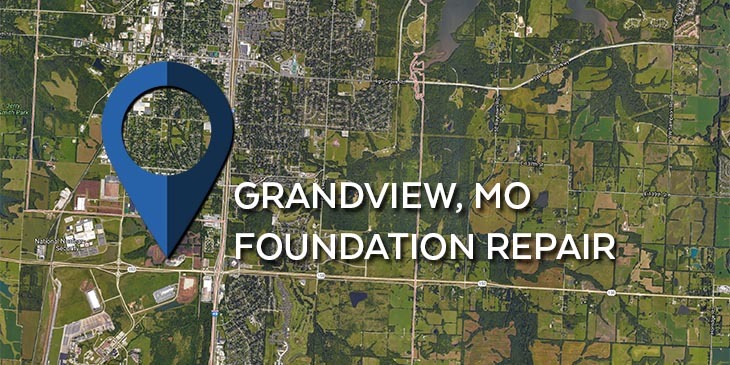 That started the growth of Grandview and our town is still growing now. It is a landmark of the town’s history and the original depot still remains in the town today. If you have foundation issues in your home such as cracks, leaning walls or chimneys, or a sinking foundation, then you need to have a professional take care of the issue. It is necessary to have these issues taken care of to keep your home sturdy. KC Pro can solve your foundation repair problems and make the changes quick and permanent. Soil-related disturbances tend to be a large factor when needing foundation repair. Poor compaction, overloading, and excessive materials that expand and shrink with the changes in the moisture content greatly impact the amount of stress on your home’s foundation. We will use Helical and Steel piers to revert your home’s foundation to it’s original condition. Through a process called underpinning we will use the piers to provide additional support to the structure. We also have foundation repair fixes for areas that have undergone severe damage. Water leakage is often the result of foundation settlement. When your home settles it may sink into the ground a few inches and cause areas of the basement walls to crack. These cracks become an open door to water resulting in damaged belongings and potential mold. You can rely on KC Pro to provide you with the absolute best service in the industry. Along with the foundation repair that KC Pro offers, we also can provide you with basement waterproofing Grandview MO. We have many waterproofing services that can service your home in your waterproofing repairs. We have exterior and interior waterproofing, sump pump and sump pit installation, crawl space encapsulation and repair, and also wall crack injections. Exterior Waterproofing System – This system involves digging up the area and rebuilding it. Before the installation process, we review the landscaping and terrain requirements around your home. Interior Waterproofing System – We can keep your basement dry by installing quality sump pumps, water channels, vapor barriers, sump pits, channel drains, and drain pipes. Sump Pumps – If you need a new sump pump, our sump pumps are designed to be most energy efficient on the market. They prevent flooding basements by removing water from your home. Sump Basins – Its unique bell shape helps keep water from surrounding the sump pump. Crawl Space Encapsulation – This keeps your crawl space free of moisture, humidity, and water damage. Wall Crack Injections – They are used to seal wall cracks and restore the original strength of your concrete wall. Whatever your basement waterproofing needs are, we are here to help. If you are in need of foundation repair in Grandview, or in any of the surrounding areas, then contact us today at KC Pro. Can Winter Weather Damage My Foundation? Can Water Cause Foundation Damage? How Much? We want to hear from you! If you have any questions regarding our services or are interested in talking with us about a project, please complete the contact form below. We will get back with you ASAP.